EVEN before the disaster, Scranton had been having a poor century. In 1902 the Lackawanna Steel Company left north-east Pennsylvania in search of better access to transport and a less assertive labour force. The area still had coal, and enough spark to start new industries: in the 1920s a local button-maker became the country’s leading presser of 78rpm records. But after the second world war demand for coal fell. Then, in 1959, miners working coal seams broke through the bed of the Susquehanna river, which flowed into the caverns below like bathwater swirling down a plughole. The mines never recovered. The damage is in plain sight. The valley through which the Susquehanna runs is lined with shuttered factories. The city of Scranton faced near-bankruptcy in 2012. Yet despite almost a century of economic blows, more than half a million people remain in the area. It is a similar story in a host of other once-proud parts of the industrialised world. They have not found ways to thrive in a digitised, globalised economy. But they have not disappeared. Politicians have tried to help. State and local governments have spent hundreds of millions of dollars over the past decade on infrastructure and redevelopment projects in the Scranton area, just as they have in Britain’s Teesside, and France’s Pas-de-Calais. By one estimate Pennsylvania spent over $6bn between 2007 and 2016 on corporate subsidies, more than any other state. Much of that was dished out in its depressed north-east. But throwing money around is not enough. To improve the lot of left-behind places, policymakers need more determination and greater consensus on what works. Do better they must. The forces that drive regional disparities are built into the mechanisms of globalisation, which makes them hard to resist. It is true that globalisation could stall or go into reverse. Indeed the desire that it should do so was part of the reason that voters in north-east Pennsylvania swung heavily to Donald Trump in 2016, delivering him the state. It was in a similar spirit that areas of alienation in Britain, like Teesside, voted for Brexit and France’s economically battered north offered strong support to the Front National of Marine le Pen. But even if globalisation were to stop in its tracks, the regions it has weakened would not magically improve. Economists once thought that, over time, inequalities between both regions and countries would naturally even out. Rich places with more money than investment opportunities would sink money into poorer ones with untapped potential; technological know-how would spread through economies. For much of the 20th century there was evidence to back this up. Lagging industrialised countries grew much faster than the richest ones in the decades after the second world war. In 1950, for example, real output per person in Italy was 33% of that in America; by 1973 it was 62%. From 1880 to 1980, income gaps across American states closed at an average annual rate of 1.8%: real personal income per person in Florida rose from 33% of that in Connecticut to 82%. Similar convergence occurred across Japanese prefectures and European regions. At the same time, as geographical differences dwindled within and between industrialised economies, the gap between those economies and the rest of the world widened. American incomes, adjusted for living costs, were a bit less than nine times those in the world’s poorest countries in 1870, but nearly 50 times larger by 1990. As the 1980s gave way to the 1990s, both trends changed. 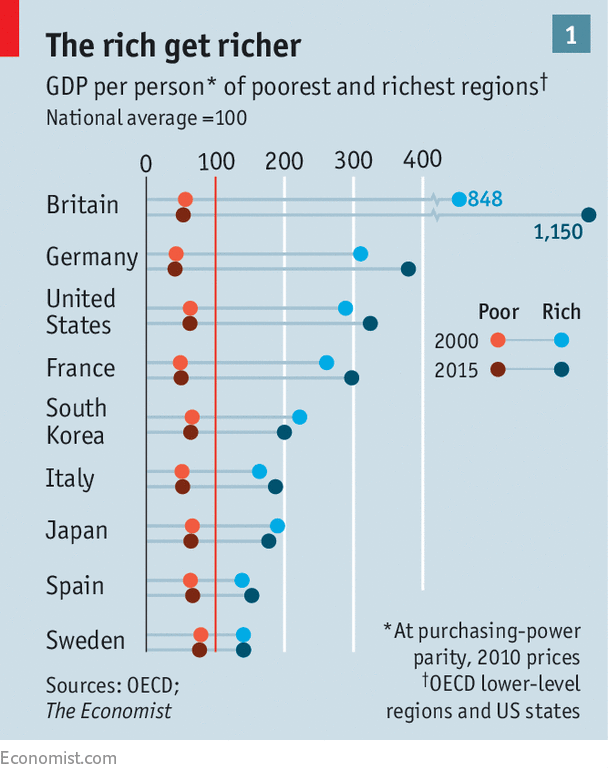 Regional inequality within rich countries increased. Poorer economies began catching up with richer ones. It is no coincidence that fissures opened within the rich world’s economies as poor countries began catching up. It was a predictable result of political and technological change—one that governments in the rich world largely ignored and that their advisers, and economists in general, made too little effort to point out. When countries with lots of low-wage workers begin trading with richer economies, pay for similarly skilled workers converges. Those in poor economies grow richer while in rich countries workers get poorer. The effects are felt more in some places than others, and not only because the sort of people who lose out to trade tend to live in similar places. Globalisation did direct damage to many local and regional economies because of the way those regions work. Firms—particularly manufacturers—often do better when they are close together. A maker of industrial machinery saves on costs when it is near the firms that provide it with raw materials or components, as well as to its customers. A cluster of manufacturers attracts workers. Where there are a lot of firms and workers, new ideas are spawned and spread. Similar dynamics apply in other industries. Financial firms do well in New York because they are close to the banks that finance them and clients that hire them, and there is a vast pool of specialised talent. Startups in Silicon Valley have access to financing, customers and new ideas they will not easily find elsewhere, not to mention competitors’ employees to filch. The size of such clusters depends on the size of the economy. Open a national economy to a world’s worth of trade and the scale changes. Firms can sell to customers in other countries as well as in their own, and those in the most productive clusters see their existing advantages pay off. More sophisticated financial firms in London outcompete those in Frankfurt; California’s internet firms overwhelm competitors in Paris. Producers in less fortunate regions either have to up their game, specialise, move or go under. Increasing returns of this sort do not imply that trade is a zero-sum game. A larger, more integrated market enables production at more efficient scale and increased global output. Consumers gain access to cheaper and better goods and services (including new foreign varieties). They do imply, however, that production will become more geographically concentrated. Cities with long-standing industrial traditions that could get by in a smaller economy find themselves bleeding talent and jobs. The past few decades have been good for the richest firms and places. They are as productive as ever; America’s slowing productivity is the result of increasingly poor performance by firms below the upper ranks. Across a wide range of industries the share of output generated by America’s top four metropolitan areas for each industry has risen, often substantially. In the financial industry their share of output rose from 18% to 29%, and in retail, wholesale and logistics from 15% to 21% between 2001 and 2014. Since 2013, the share of high-salary tech jobs found in America’s eight largest technology hubs has risen, according to a recent analysis by Jed Kolko, an economist at Indeed, an online jobs site. Similarly, from 1997 to 2015 London’s share of Britain’s gross value added rose from 19% to 23%. There are several reasons why the poorer regions of rich economies did not adjust as well to the winners-take-more geography of globalisation. One is that technology seems to be moving from place to place less easily than it used to. An OECD study published in 2015 looked at the way in which productivity gains spread from “frontier” firms operating at the highest productivity levels. Since 2001 new technologies have percolated from leading firms in one country to equivalent firms in other countries more quickly. Globally competitive firms have got better at mastering complex new technologies. And fending off global rivals seems to sharpen the incentives of managers at these firms to copy other successful ones. But it is a different story within borders. Diffusion of technology from top firms in one country to laggard firms in the same country has slowed down. The authors of the study reckon that a lack of interest in adapting technologies to local circumstances may account for part of this, suggesting that the more the best firms focus on a global (rather than domestic) market, the slower productivity-improving techniques and technologies spread locally. The rise of superstar firms means that fewer places are home to businesses operating at the productivity frontier and that domestic investment is lower than it should be. In less dynamic local markets, nonsuperstars seem neither willing nor able to adopt the best technology. The rational response to such divergent economic fortunes is to up sticks. In the most successful developing countries people move to new centres of progress with alacrity, as they did in America and Europe in the 19th and early 20th centuries. The population of Shanghai doubled from 1980 to 2010, just as Manchester’s did from 1811 to 1841. But people in the rich world are less able and willing to move to thriving places than in the past. America, once inveterately itinerant, has settled down a lot (see chart 3). Even so, it is still more footloose than Europe. 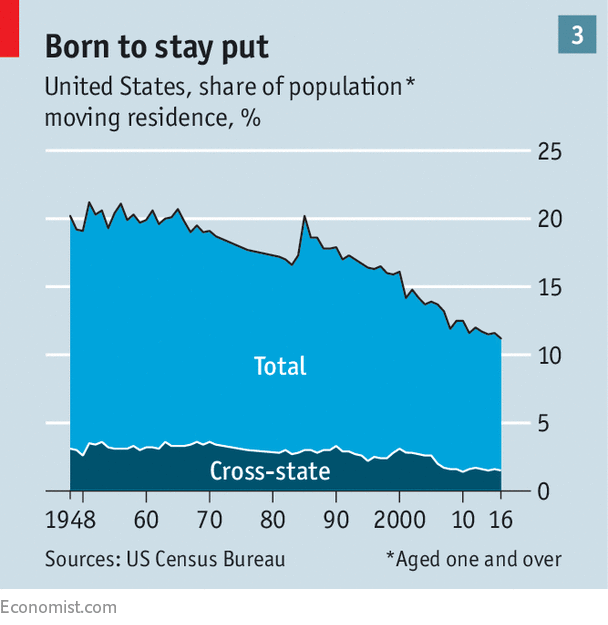 Each year just over 2% of Americans move across state lines, whereas only 1.5% of Europeans move between regions within their home country. Despite the freedom of movement created by the EU’s single market, only 0.37% move from one country to another. But mobility in America is on the decline. The pull exerted by successful places is offset by policies that restrict population growth and that were not imposed a century ago. Stringent planning rules, and homeowners who prefer low-density living, limit new building in rich cities. That makes housing hard to afford. Though the wages available in rich American cities are higher than in poorer ones, even for those without many qualifications, high housing costs more than offset the pay increase. At the same time, the push to leave failing places has weakened. 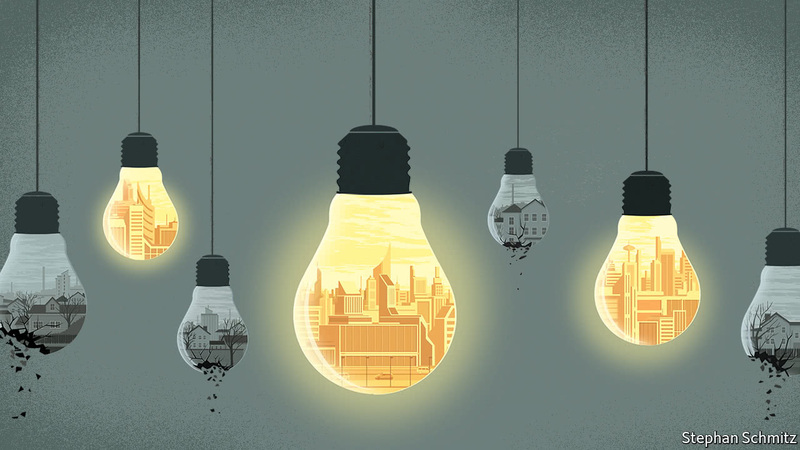 The growth of the welfare state limits the chances that declining cities will disappear. In the 19th century, mining towns like Bodie, California—which once boasted several thousand people, a newspaper and a railway station—emptied out entirely when local mines closed. Today government benefits and pension payments spare people the horrible choice between moving or penury. Indeed, they can encourage people who would otherwise move to stay put, because meagre fixed incomes go further in places where living costs have tumbled. Recent work by David Schleicher, of Yale University, recounts the ways that state and local benefits also impede movement. Public employees face strong incentives to stay put; according to one estimate, the pension of a teacher who spends 30 years in one school system is about twice that of a teacher who splits her career between two. Some benefits are tied to staying put, precisely because the authorities fear a brain drain. A new affordable college programme in New York, for example, requires beneficiaries to stay in the state after graduation for as many years as they received assistance. A diminished tendency to leave places that are not doing well is not just a matter of welfare policy and the size of the state. People do not just change jobs if they move home. They also sever social ties, from churches to hunting clubs. 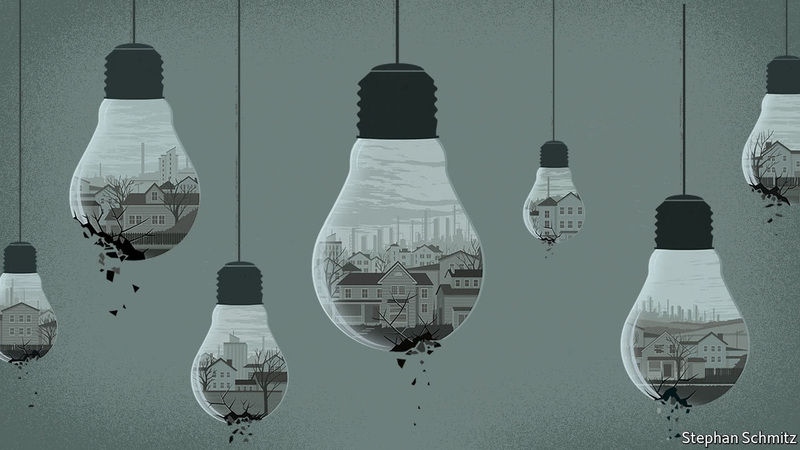 Lighting out for new territories means leaving behind family and friends, something that today’s ageing populations may find harder than the younger populations of the past. Ageing populations have other effects. Grown-up children may need to care for ailing parents; grandparents may provide a crucial source of child care. For these and other reasons, many working-age adults are finding it harder to move far from their parents than previous generations. Help—either to make it easier to set up in a successful place, or to leave a failing one—would be a boon to many, especially the young, skilled and ambitious. By making them more productive, it would probably boost GDP. But it could make life harder still for the least mobile members of society. Were New York more accessible to young Pennsylvanians, Scranton’s problems would not disappear; they would just be concentrated in a smaller, older and poorer population. Hence the attraction of policies that help people by helping the places where they find themselves. The subsidies and tax incentives showered on north-eastern Pennsylvania are hardly unique; the rich world abounds in efforts to jump-start the economies of benighted places. Economists are generally sniffy about them, with some justification. In January, for example, American Paper Bag moved its corporate headquarters near to Scranton, thanks in part to employment tax credits, funding for workforce training and a $1.4m subsidised government loan. But the firm’s arrival is expected to create only 38 jobs. “Enterprise zones”, which typically use tax incentives and hiring subsidies to encourage businesses into areas of concentrated poverty and joblessness, do little good. California’s 42 enterprise zones have failed to raise employment in targeted areas, according to analysis by Mr Kolko and David Neumark, of the University of California at Irvine. Other studies find increases in employment and wages that are modest at best. In the zones franches urbaines with which France started to experiment in the 1990s, small businesses are temporarily exempted from taxes and some social-security contributions. Most of the employment these zones have created appears to be due to firms from elsewhere moving in, which may explain why surrounding neighbourhoods typically experienced employment falls roughly on a par with the zones’ gains. Analysis of the effects of EU structural funds—money invested in poorer regions to promote convergence—finds that such spending appears to boost local output and reduce unemployment, but not necessarily in a sustainable way. A recent study of Cornwall and South Yorkshire showed that the funds improved the economic outlook of those British regions, with unemployment rates in the two declining towards the national average. In 2006, though, South Yorkshire lost access to the funds, and its gains fell away. Some interventions do seem to produce lasting change. Just over 1,000km south-west of Scranton sits the city of Greenville. It is the largest population centre in the north-west of South Carolina, which was once a thriving centre of textile manufacturing; its fast-flowing rivers powered scores of mills, which remained long after the waterwheels were replaced by other sources of power. In the second half of the 20th century, however, foreign competition gutted the industry and employment collapsed. South Carolina has not become an all-purpose manufacturing powerhouse. In fact, manufacturing employment is lower in the region than it was when BMW set up shop. But real incomes are growing and the population is booming. Greenville is 70% bigger than it was in 1990. Its success shows the value of co-ordination. There is a chicken-and-egg problem in establishing a cluster. Firms would like to be where there are workers, suppliers and infrastructure; workers want places where firms are already offering good new jobs. Neither will go where the other isn’t. But action on a number of fronts can, under the right circumstances, attract both at once, creating a kernel round which a cluster can grow large enough to become self-sustaining. After that, it may well invigorate other areas of the local economy. Strategies which build clusters through such two-way seduction are hard to assess. Work by Michael Greenstone and Richard Hornbeck of the University of Chicago and Enrico Moretti of the University of California, Berkeley compares places that lose out in competitions for big plants to those that win. They find that the arrival of a new plant raises productivity in existing factories—those that were there before the arrival of the big fish. This suggests that within clusters spillovers of technological and organisational know-how are genuine; attracting successful firms is a way to channel knowledge into lagging regions. Although a new plant can promote the diffusion of technical knowledge and provide jobs that pay well in other companies nearby, not every place can nurture a manufacturing cluster. The success of South Carolina has come about because BMW chose to put its plant there rather than somewhere else. So rather than attempting to seed clusters, governments could instead focus on spreading know-how in order to increase the attractiveness of laggard regions to productive firms. Improving the investment climate in struggling areas could help. In 2015 the Economic Innovation Group, an American think-tank, published a report by two economists—Jared Bernstein, a Democrat, and Kevin Hassett, a Republican, who now heads Mr Trump’s Council of Economic Advisers—which proposed a way of doing just this. The idea was to use tax incentives to create new financial vehicles, not unlike venture-capital firms, with a place-specific investment mission. The intention would be to provide access for investors to regional-investment opportunities, turning struggling parts of rich countries into domestic versions of emerging markets. Because a “Cleveland Fund”, say, would be run by a single manager or management team, its investments could be co-ordinated. Investment aimed at enticing businesses and attracting workers could be designed with each other in mind. Legislation based on the idea has been introduced in Congress, with bipartisan support. The public sector might also play a more direct role. In the late-19th century, America’s federal government set up what are now known as land-grant universities. The legislation gave federal land to states, which were meant to sell it to raise money to create agricultural and mechanical colleges. Those colleges were initially intended to provide a solid technical education for young farmers and engineers across the great American expanse. They were fairly soon given additional missions: first, to carry out agricultural and engineering research, and second, what was termed “extension”—connecting with working farmers and mechanics in order to spread knowledge of new techniques and best practices. Today, many of those institutions have become fully-fledged research universities, which often co-operate with local firms to commercialise research findings, develop curriculums and place students in new occupations. Germany has its own, more recent version of this model, called the Fraunhofer Gesellschaft. Started in 1949, the system now consists of a network of 69 applied research institutions, which receive 30% of their funding from national and local government, with a mission to develop and improve technologies in partnership with German firms. Governments could invest in an effort to expand the reach and remit of such institutions (or to create new ones). These could be given resources to expand training for working adults. And they could prioritise extension once again by helping local firms to master new technologies such as machine learning, augmented reality, additive manufacturing and so on. The better understood a new technology is, the less important it is for those wishing to use it to be near the people and firms where it originates. Post-secondary education could expand its focus from equipping individuals with skills to speeding the flow of knowledge from those who generate it to everyone else, companies included. If there is a particular reason to favour dispersion of technological know-how and economic activity, it is that the concentration of such things also corresponds to a concentration of power. Since the late 1990s, as you would expect given the logic of globalisation, American industry has become more concentrated and more profitable. Superstar firms can draw on their financial and political capital to quash or take over would-be rivals, leaving fewer high-growth companies with the potential to anchor local economies. Not all these superstar perks are necessarily invidious, but looked at in the context of regional economies they can have striking effects. The announcement in June that Amazon would purchase Whole Foods, a grocer, led to a sharp drop in the share prices of companies like Walmart (headquartered in Bentonville, Arkansas), Target (Minneapolis, Minnesota) and Kroger (Cincinnati, Ohio). Amazon has since asked America’s cities what they would be willing to offer to get its planned second headquarters, equal in status to the original in Seattle. Scores of cities responded with detailed investment plans and juicy incentives: a testament to the power wielded by America’s corporate superstars. But Amazon’s demands—which include a large, skilled workforce, lots of big-city amenities and extensive transport links—suggest that the prize will go to somewhere already thriving, rather than a place in need of the lift a firm like Amazon could provide. It is much harder for a new communications technology to take root in an unpromising place than it was when Scranton rose to dominate the creation of newfangled shellac records. Efforts to accelerate technological diffusion—which might include the more rigorous application of antitrust rules—could raise competitive pressures in the national economy in a way that favoured regional competitors. But the segregation of cities into a small set of haves and a much larger set of have-lesses tends to mean that elites (in business and politics) rub elbows only with each other. That makes them ever less sensitive to the costs of regional inequality. The growing concentration of corporate offices in the vicinity of Washington, DC is a particularly obvious example of this.